From rapping for the sake of rapping, to speaking for a generation of Arab third culture kids. It was three Augusts ago, at an Angels and Demons themed birthday party (which I took very seriously, turning up in a zombie Cleopatra costume which I had created myself, amateur special effects makeup included, only to find everyone else was dressed normally albeit the addition of angel wings or devil horns here and there) that I met Mvrs (pronounced Mars). An eloquently spoken (and good-looking) young man who turned out to be the birthday boy’s housemate came up to me while I was dancing to a deep house set and introduced himself, and then told me how cool he thought my costume was. We have been friends ever since. 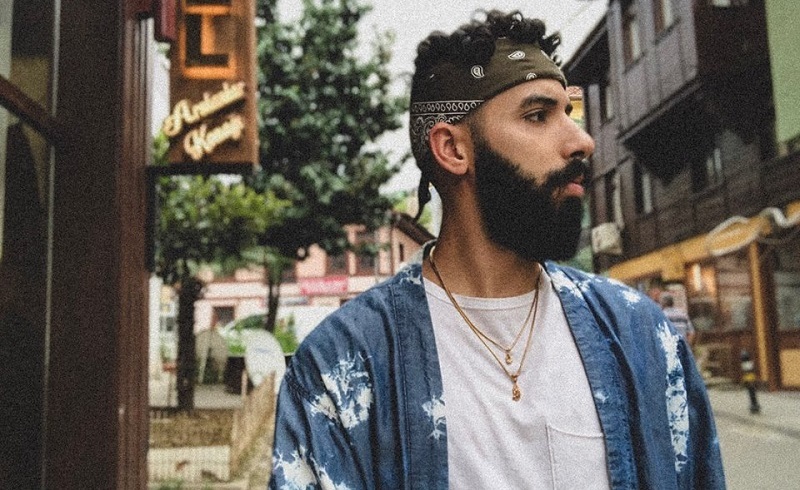 I discovered soon afterwards that not only was Mvrs an incredibly talented musician and hip-hop artist, but that he was a third culture kid and a child of the Egyptian diaspora, just like me. Fast forward a year later, and I am at his first major performance, feeling like a proud mother as he takes the stage and hundreds of club-goers go wild as he raps lines that are as fiery as the bursts of flames that are ejected from the stage every few minutes. His energy is contagious and the audience are lapping up every bar and beat. Mvrs, or Ammar Abouelghar as he is known to me, hails from Alexandria, Egypt and is a graduate of Information Systems Design from Carnegie Mellon University in Pittsburgh, Pennsylvania. He works in graphics design and digital marketing by day, and when he is not at work, he is in his studio, writing and recording music. This self-described experimental artist discovered his talent for songwriting at the age of 13 and released his first album, Be Leaf, in 2012, going on to release another three albums, Theeb, The Leaf Banger and the most recent Out of Bounds, in which he paints a picture of the trials and tribulations of a third culture kid. Out of Bounds is a dichotomy of trappy banger tracks mixed with melodic and emotional hooks, and groovy upbeat jams. With the recent release of his track 'Ana Bas', his first in the Arabic language song, from his latest album Out of Bounds, I thought it was high time that the Middle East got to know this musical prodigy a little better. While I like to think of myself as an experimental artist, and I always try to push boundaries and try new things, I owe it all to hip-hop. It’s what gave me a voice; a platform to express my thirteen year-old trials and tribulations. Like every Egyptian kid, I was being bred to become the next ‘well-respected doctor’, but I always had a thing for poetry. It wasn’t until I had to write a poem for English class that I realised I can rhyme, too. But that wasn’t hip-hop just yet. I owe my start to two people. One, my English teacher, Mr. McIlroy, who told me that I have a gift and I should write more. Two, my good old friend Ojetola, who got me to listen to the first rap song I had ever heard, ‘When I’m Gone’ by Eminem. I was captured by the way he used words to create emotion and express himself. Your songs seem to be quite personal, in particular 'Out of Bounds' and 'Bobby Valentino'. What is the story behind your track, 'Right From The Start'? I think that’s my main fuel. Art is self-expression first and foremost. It makes the music genuine. I write about how I feel. If I’m stuck and I can’t write, I write about how I can’t write! 'Bobby Valentino' is very different. It’s one of the few records where the focus is completely shifted. It will always have a special place in my heart. How would you describe the experience of third culture Egyptian kids who live outside of Egypt? Being a third culture kid is a double edged sword for me. On one hand, it’s a pain. It’s in our nature as humans to want to belong to something bigger, be it a family, a community or a society. As a third culture kid, you’re stripped from that. You’re never fully accepted in whatever country you live in abroad, you’ll always be an ‘immigrant’ and then you’ll never be fully accepted as an Egyptian in Egypt, because of how different life abroad made you. On the other hand, it’s amazing. You’re exposed to so many people and learn from so many cultures that it makes you quite unique as an individual. You stand out. It also opens your mind and makes you non-judgmental. Your approach and way of thinking about things is a lot less one-dimensional, which is a plus for me, as an artist. How would you describe the evolution of your music, since you started? That phase was a big turning point for me. I had gotten a good grip on my flow and my bars as a rapper. I felt like I no longer needed to prove that to myself (I didn’t even know I could sing at the time). That’s when I realised, it’s not enough to rap about rapping. You need a message. You need a topic. Something more personal. Something the listener can walk away with and feel like they’ve learned something new or different. Having a topic meant a better crafted chorus and hook and that’s what got me to start adding some melody to my music. I wasn’t very confident in my ability to sing at the time, but friends of mine were pushing me towards trying to sing more. I am still learning and growing as an artist. I don’t think that ever stops. It’s a key ingredient. An artist needs to keep evolving and growing, and that only comes with consistency. Keep making records to make better records. I have a folder stashed away with so much unreleased music from back then. I keep it for occasional “let’s go back and cringe / see how far we’ve come” moments. Do you feel like the Arab World has an understanding and appreciation of the rap/hip hop scene? I think hip-hop is in its prime right now. It’s the most listened-to genre in the world according to an analysis done by Spotify and as far as numbers are concerned, it’s the number one selling genre in the U.S. That would technically make rap, the new ‘pop’ or popular music. We can also see its influence in a lot of Arabic music nowadays. Egypt’s Mahraganat use a lot of the same style and techniques from hip hop. The same goes for the Gulf-based Shailat. There’s an insane growing base of hip-hop artists and fans across the region. Saudi Arabia listed hip-hop as an official activity under their Ministry of Culture. And it’s only getting bigger. The UAE scene has never been stronger. Sony Music Middle East is signing artists from Bahrain, Lebanon, Morocco, etc. Sudan is a treasure full of upcoming artists with mad talent, too. How do you view the rap/hip-hop scene in Egypt? I’ve recently come across a few Egyptian artists producing a wave of new school trap records, which is a lot more appealing to my personal taste. The Egyptian scene has been quite an unexplored territory for me for the longest time. I’ve always asked this question, “Why do we hear about artists from all across the region, but not many from Egypt outside the Egyptian border?” I’ve heard a few tracks by Lege-Cy, Wegz, and Marwan Pablo and I like the sound and energy these guys are bringing. Why have you chosen to rap mainly in English and not in Arabic? I think it’s just how hip-hop and I first met. It was introduced to me in English, and that’s how it’s been ever since. Additionally, it’s easier to reach the international audience if you make music in the most spoken language around the world. That being said, my music is a reflection of myself, so you’ll always catch me throwing a few Arabic phrases here and there. My debut album was titled Theeb, which is a term that has been used in the Arab culture to describe loyalty, bravery and wittiness. My latest track, 'Ana Bas', is the first time I perform a full Arabic verse, so the response to that will be interesting to see. 'Ana Bas' started as an iPhone note that I wrote in 2014, on my last visit to Egypt. I came across that note accidentally this year, but it had been so long that I forgot how the flow and melody was meant to be. Around the same time, I was introduced to Karet Safar, which is a dope Sudanese folklore group. We had a jam session where they played guitar, oud, drums and trumpets, while I was freestyling and singing. As I was running out of words to freestyle, that Arabic verse came to mind and I just started rapping it to the melody to the rhythm they had going. It fit perfectly. We then decided to sit together and create this very experimental track. All the instruments were live instruments (except for the drums). Karet’s very own Moamal sang the chorus, then it was all produced and put together by Toronto-based Egyptian producer, Trak. What has been your family's reaction to your music? Are they supportive? My immediate family was very confused at first. Why is this kid up at 3AM shouting at his laptop? Although my family is relatively traditional, they never held me back or tried to force me to stop. They thought it was a phase and as long as it didn’t affect my studies, they were fine. As I grew as an artist and this ‘phase’ seemed more serious, they had a talk with me to try and understand where I wanted to go with this, and I was very clear about my passion. They became a lot more accepting and supportive. I show them my releases and footage of my performances now. Sometimes my dad shares the works of Arabic poets with me. It’s kinda dope. What are your future plans for your music? Are there any new collaborations you have coming up? I had a bit of an awakening at the start of 2018. I have been too focused on pushing my music outside, reaching an international audience. This year, I’m bringing it home to Egypt. I want to grow the scene here. I’m using my platform, which I have been building for years, to bring out and push new artists from the city. There are so many talented signers here who just do covers. I want less covers and more original music. I will help you write, record and even distribute your song to all my audience. And this should answer your question about collaborations; you will see a lot of new names and voices from the city soon. I met this really talented girl, Layal, recently and we’re working on her first single right now, so look out for that! Follow Mvrs on Soundcloud, Instagram and Facebook. Self-confessed book addict and history nerd. Prefers to be called 'eccentric' over 'weird'.